Santa's Bingo - New Bingo Site - 500% Bingo Bonus! Yet another Live Bingo Network white label site was launched very quietly during the past few weeks. 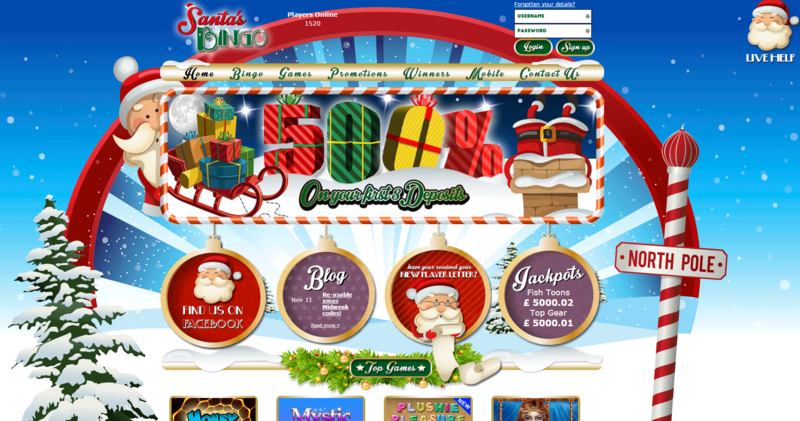 Santa's Bingo is the name of the new site and it has arrived right on time for the holiday season. In spite of the cool theme and name, don't expect too much difference between Santa's Bingo and the tens of other new bingo sites recently launched on the Live Bingo Network. All of the promotions and games are exactly the same as those featured on Galaxy Bingo, Carboot Bingo, LMAO Bingo, Snappy Bingo and others. This could be a good thing or a bad thing depending upon player preferences. The main difference that players will notice between Santa's Bingo and the other Live Bingo Networks sites, besides the nice Christmas-themed graphics, is the very big 500% welcome bonus package. This is the main thing that sets Santa's Bingo apart from the rest of the LBN pack. Players would be advised to check this site out now as one can only speculate how long it will be around for once the Christmas Holiday Season is over. So hop in your slay and ride on over to Santa's Bingo now for a very merry bingo experience!